heard she even received a marriage proposal. Yep she's had proposals, sight unseen! By the way she is very pretty to go along with her wonderful dumplings. So to get you started on the road to marital bliss here is my recipe for Chicken and Dumplings. My husband says they are the best ever (he is very smart man)! Today I'm made this recipe with leftover baked chicken. So easy on a busy day but you can also use a boiled chicken. Depending on how your Mom made them or what region of the country your from, you might like flat or puffy ones. For the flat ones I just use all purpose flour and for the puffy ones I use self-rising flour. You can dump the dumplings in the pot by a tsp or roll them out and cut them into squares. Really which ever you have the time for. In a pot of water boil cut up chicken until done. For the leftover chicken I boiled about 40 minutes in a pot of water. To make gravy: in a pot take 1 qt of the chicken broth from boiled chicken and heat till it has return to boiling. Mix water and flour in a small bowl then gradually add to the broth. Stir till thickened and then add 1/2 tsp of salt and pepper. To make the dumplings: Mix 2 cups of flour (self -rising or all purpose) with the milk and oil. Roll out and cut into dumplings or measure by teaspoonfuls. 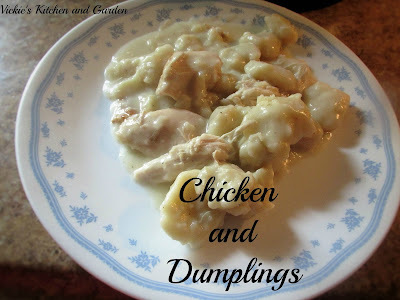 Add gravy back to the pot of chicken and then drop the dumplings in one at a time. Cover with a lid and simmer on low approximately 12 to 15 min. or until dumplings are done.